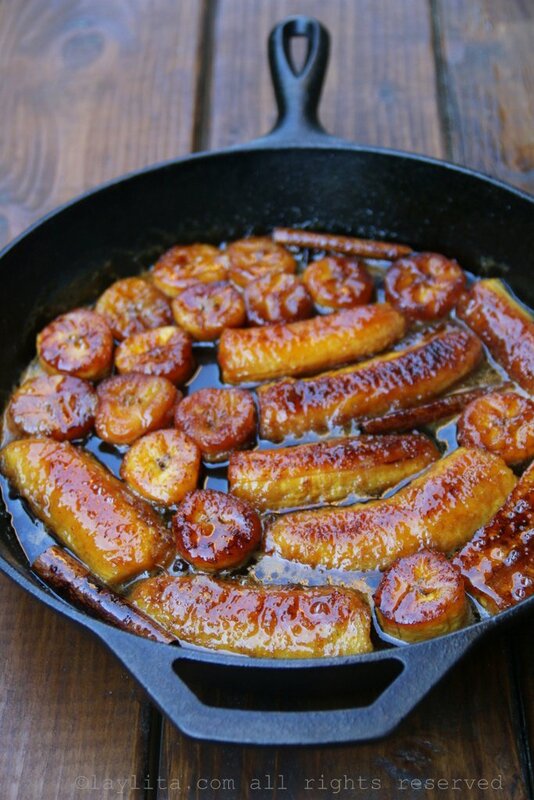 These caramelized sweet ripe plantains are cooked in a syrup of panela or piloncillo brown sugar, sweet wine, cinnamon, allspice, cloves and Tabasco Chipotle sauce. 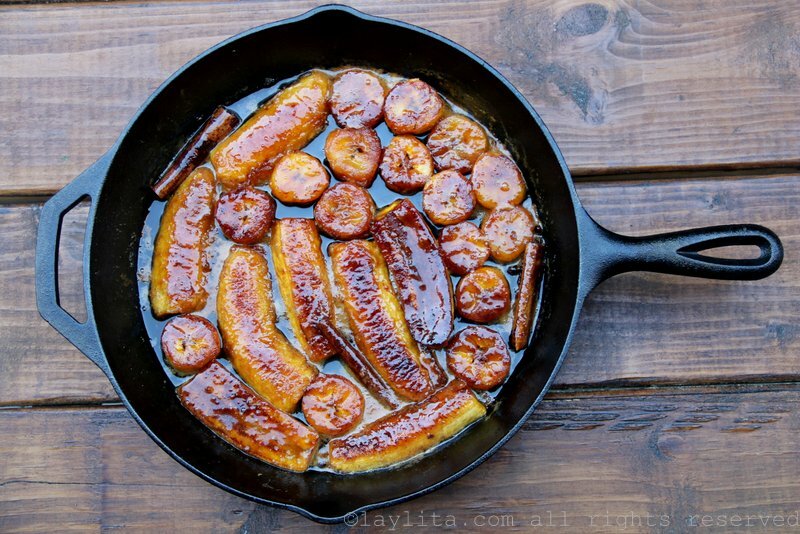 Caramelized plantains are a popular dish throughout Latin America. 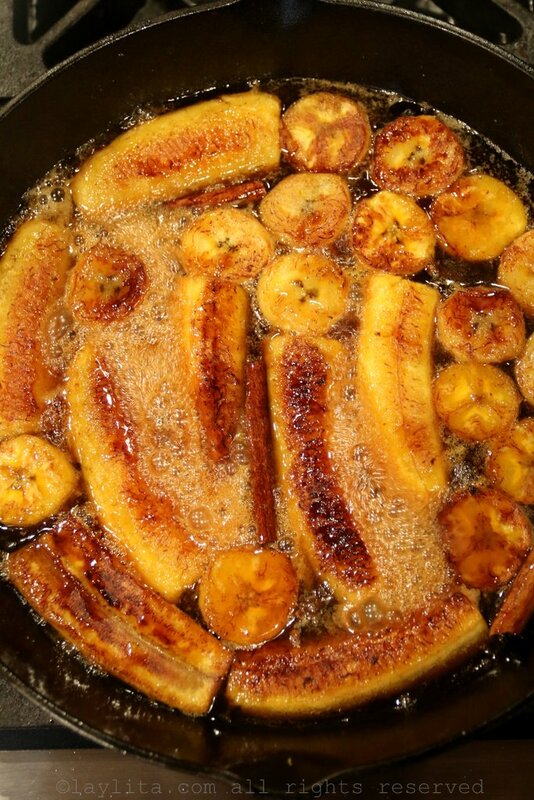 There are many different variations including platanos al caldero, platanos calados, platanos en tentacion, and dulce de platanos; but the main idea is the same: delicious ripe plantains cooked with sugar and spices. 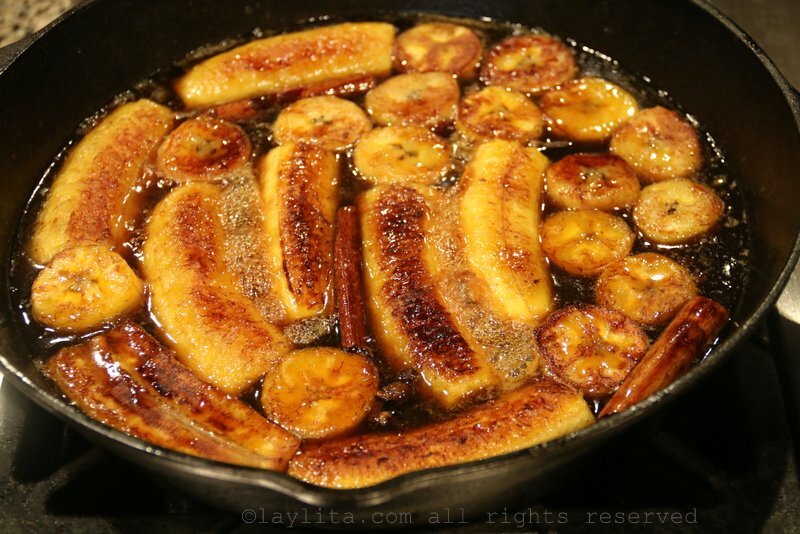 Easy recipe for ripe plantains caramelized in a spiced syrup of panela/piloncillo, sweet wine, cinnamon, and spices. 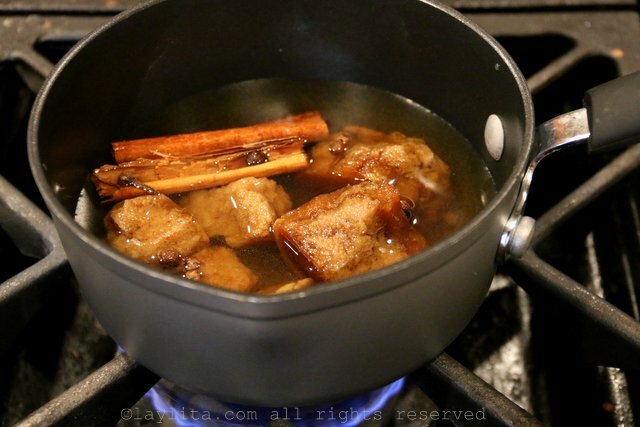 Combine the panela/piloncillo or brown sugar with the sweet wine, all spice, cloves, and cinnamon sticks in a small saucepot. 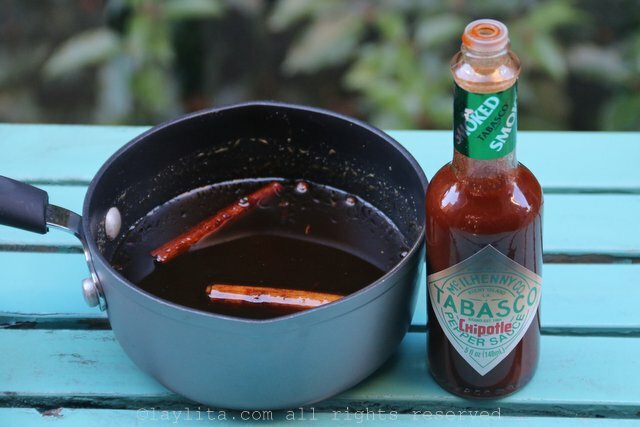 Cook over low heat until the panela/piloncillo is completely dissolved, add about ½ tablespoon of Tabasco Chipotle sauce, and continue simmering until the syrup is infused with the flavor of the spices, taste and add the additional Tabasco Chipotle sauce based on your spiciness preference level. Strain the syrup to remove the whole spices (cloves, all-spice, cinnamon), and save the syrup. You can add back the cinnamon sticks if desired, but make sure to completely remove the smaller spices. Heat the butter in large pan or skillet. 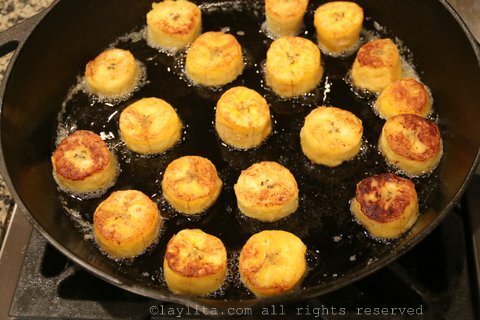 Add the plantains and fry them on each side until golden. Add the panela or piloncillo syrup, cook for about 25-30 minutes on low medium heat. 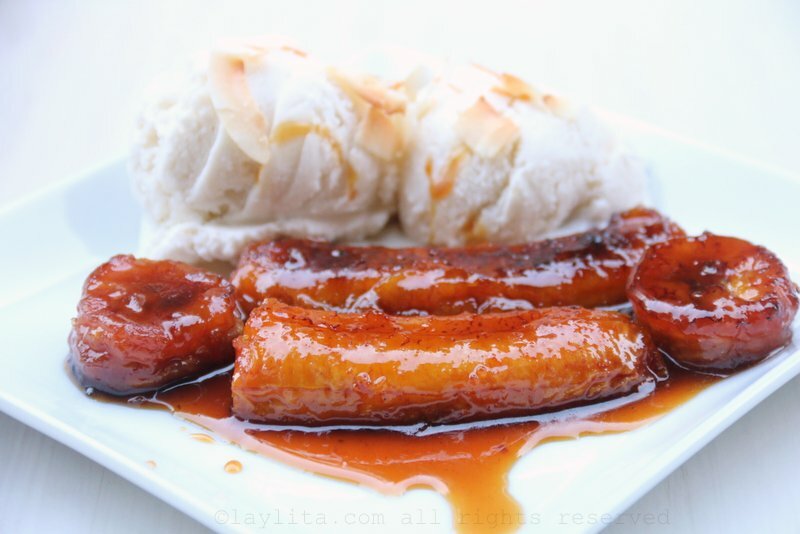 Serve the caramelized plantains warm with fresh cream or with coconut ice cream. 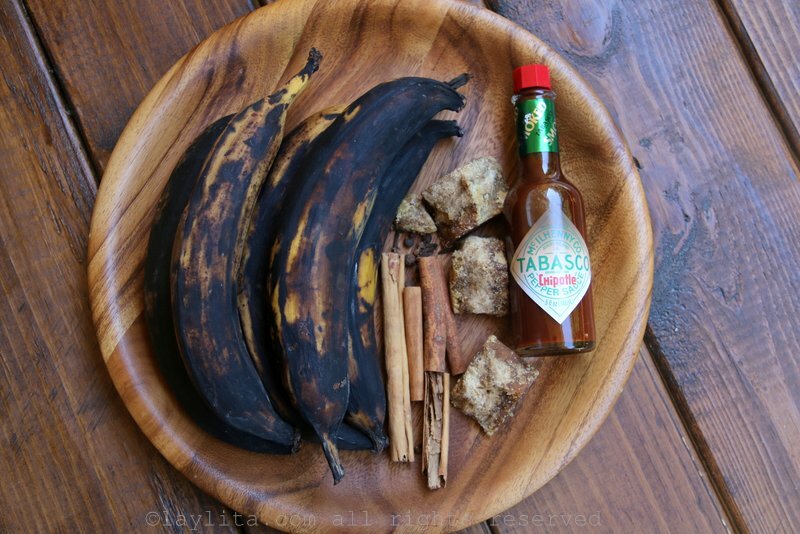 My recipe for caramelized plantains is inspired by this idea, with the small twist of adding some spicy Tabasco Chipotle sauce. 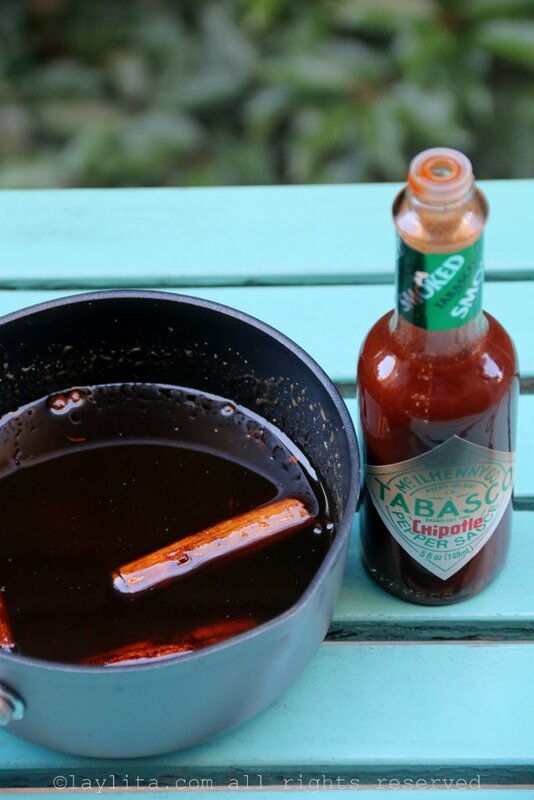 It’s no secret that I love spicy hot sauce, and I have to say that Tabasco Chipotle hot sauce is one of my absolute favorites. My kids also love it and we can easily finish a whole (5 oz) bottle per week in our house. 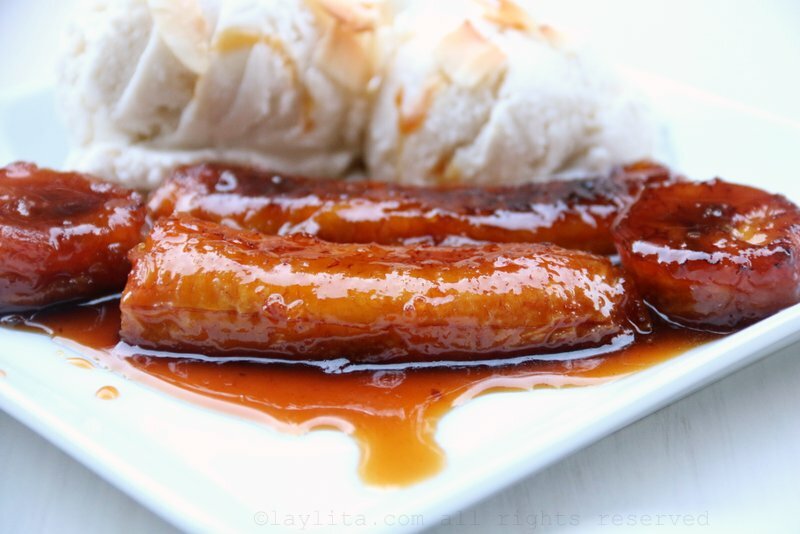 I’ve always loved the flavor combination of sweet ripe plantains with hot sauce, so the idea to incorporate the Chipotle sauce into the syrup for the caramelized plantains was a no-brainer. 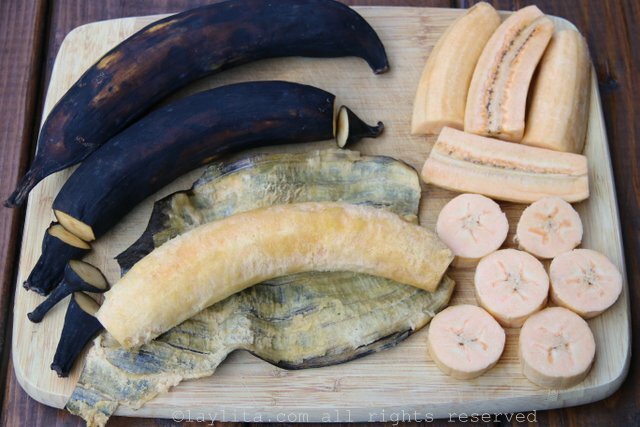 The plantains should be very ripe for this recipe, with the skin completely or almost completely black. 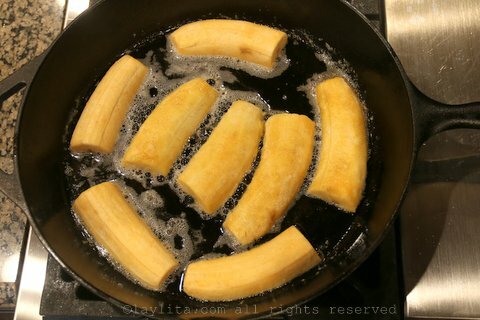 You can either cut the plantains in halves or in thick slices. 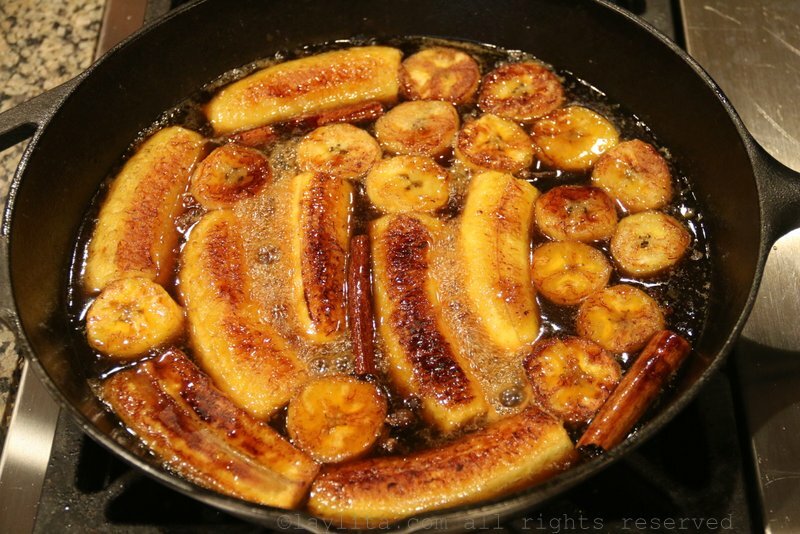 I also added sweet wine, either Moscato wine or a Riesling work great, instead of the usual water, to the preparation for the caramelized ripe plantains. If you don’t want to use sweet wine you can replace it with sparkling grape juice or go back to basics and use water. 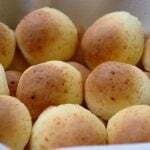 I recommend using panela, also known as piloncillo, which is hard brown sugar cane. 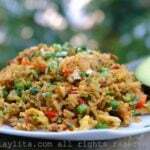 You can usually find it in most Latin grocery stores and it comes in blocks or cones. You can use regular brown sugar in case you can’t find it. I prepared the syrup separate, then browned the plantains in butter, added the spiced syrup, and let the ripe plantains finish cooking and caramelizing in the syrup. 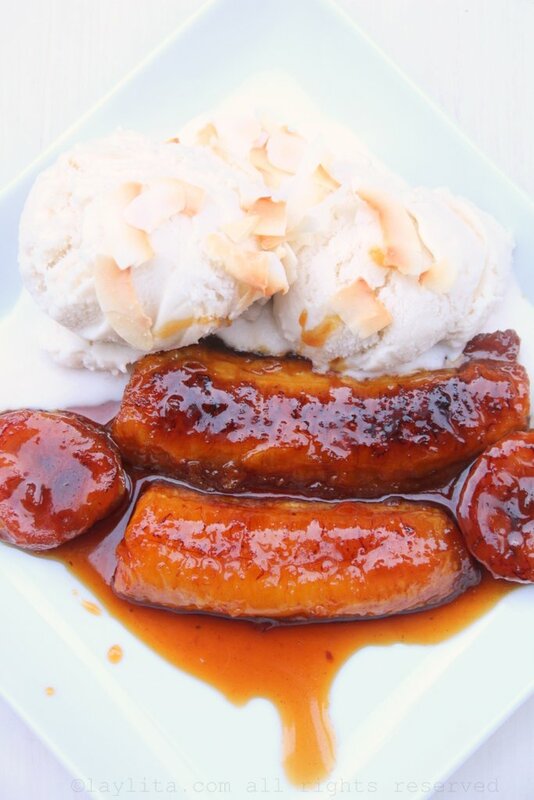 You can also prepare this recipe using bananas, but reduce the cooking time of the bananas in the syrup by half. 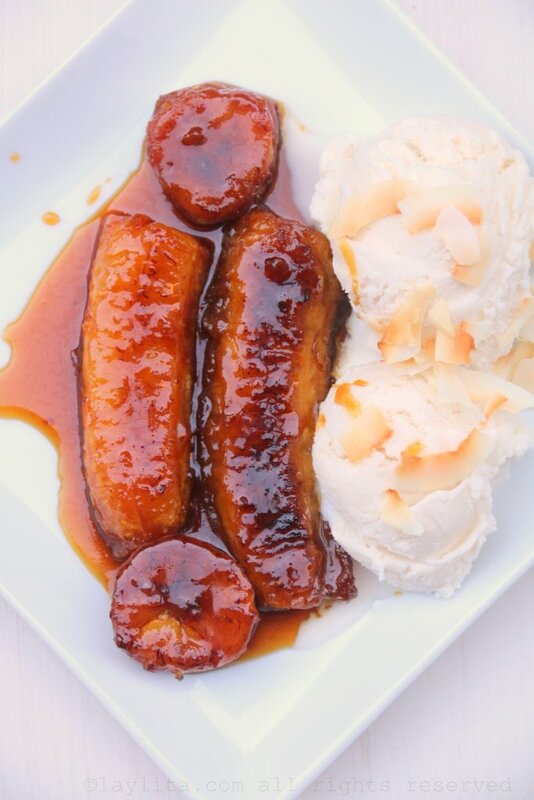 I served the caramelized plantains as a dessert, with homemade coconut rum ice cream, you can also serve them drizzled with some fresh cream. 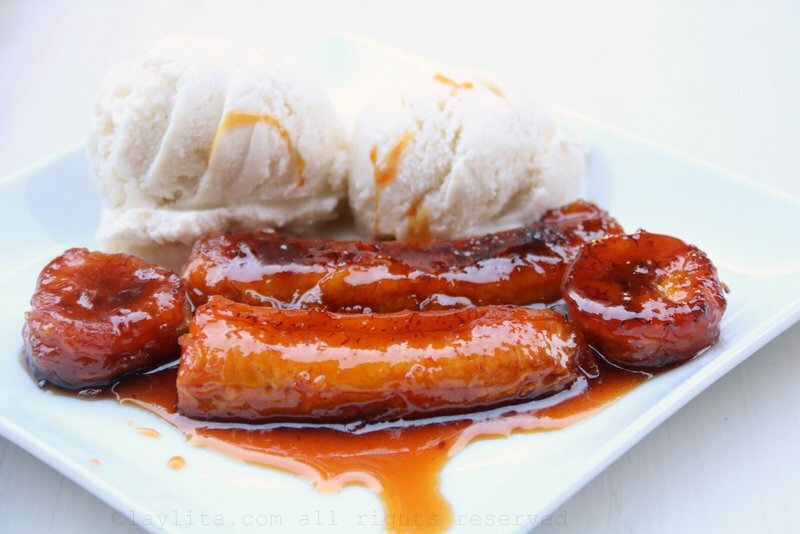 In Latin America, caramelized sweet plantains are also sometimes served as a snack, an appetizer, or a side dish. I’m drooling over here! I love the idea of sweet and spicy, looks fantastic!